with a naturally vibrant sense of life"; "quality" bass reproduction with "wall-flexing" power; treble is "sweetly detailed and delicate"; can play loudly -- even when driven by 18W SET amps -- and softly with equal aptitude, perhaps due to very low distortion. Features Highly refined two-piece design constructed of advanced materials; Focal, ScanSpeak, and Dynaudio drivers; Phase Delay Correction system for time-aligning the drivers; 12-stage painting process that creates speakers of "intense mirrored beauty." Use Wilson Audio or its dealer will "vowel in" the speakers in the buyer's listening space; tremendous reviewing tool because of their "higher-than-average rated efficiency" and ability "to convey the differences in electronics, interconnects, speaker cables and power cords." Value A true "luxury item" from a company that "doesn't miss a detail" with the WATT/Puppy 6, especially in terms of sound. Among his contributions to high-end audio, David Wilson has influenced the way audio products, loudspeakers specifically, are discussed. His WATT/Puppy speakers have taken their place alongside products like Kleenex and Band-Aids to describe the entire class of products, two-piece loudspeakers, to which they belong. And along the way, the WATT/Puppy has also become a reference of sorts, a speaker to which countless others have been compared. Just how many times have you heard, "It's better than a WATT/Puppy"? But even with all of their fanfare and admirers, the various iterations of the WATT/Puppy have not been universally loved. In my case, while I've been able to understand what the WATT/Puppy of various vintages that I've heard do (and by no means have I heard every one), I've never been able to cozy up to them. They always struck me as sounding analytical, which probably testifies to the WATT's heritage as a studio monitor, and while their bass has been incredibly powerful, it has always sounded detached from the rest of the sonic spectrum, at least to my ears. I've heard proponents of the speakers tell how David Wilson and crew have been able to improve various things about the WATT/Puppy over time, but I've always thought the same things about them: unique sound that's impressive in some specific ways but not for me. So why then am I reviewing the WATT/Puppy 6? I first heard the newest version of these venerable speakers where many other audiophiles did, at HI-FI '99 in Chicago, and the sound there was very promising. Additionally, my exposure to previous versions of the speakers was certainly not lengthy, so I was curious to hear the WATT/Puppy 6 and determine for myself -- and tell you -- if the speaker has evolved into one whose sonics I can more than admire from afar. More than any other speaker I've reviewed, the $19,990-USD-per-pair WATT/Puppy 6 is a collection of parts that make up a system for transducing sound. Of course, there are the two main pieces, the WATT (Wilson Audio Tiny Tot) minimonitor, which can be purchased separately and used on stands, and the Puppy bass cabinet. But there is more to assembling the speakers than merely connecting the two halves via the supplied umbilical. The WATT actually sits on screw-in spikes on top of the Puppy, two in front and one in the rear. These are part of Wilson Audio's Phase Delay Correction system and significant because which rear spike is used depends on the distance of the speakers from the listener, the spike adjusting the tilt of the WATT and, according to Wilson, time-aligning its drivers with those of the Puppy. Underneath the speakers are specially made spiked footers (called Puppy Paws and available in silver or black finish) with spacers that couple the speakers to the floor of the listening room. The thick cable that connects the WATT and Puppy is specially sourced from Transparent Audio; it pokes out from a hole on the top of the Puppy and connects to a set of binding posts on the WATT. There are separate user-replaceable ports for the WATT (which you choose depending on the kind of amplifier you have), and even two different sets of grilles: the traditional fabric-on-a-frame type and some simple foam covers, both of which affix to the front of the speakers via hook-and-loop fastening. Finally, there is also a tool kit that has everything you'll need to hook up the speakers, including a wrench for the binding posts and special cloths for cleaning dust off the cabinets. The speakers and all accessories come packed in four foam-lined wooden crates; for shipping, the speakers are bagged and protected with a plastic film that gets removed after the speakers have been set up. Needless to say, Wilson Audio doesn't miss a detail with the WATT/Puppy 6. But the real beauty of all these individual pieces is that you won't have to worry about them because a representative of Wilson Audio or, more likely, your dealer will install the speakers for you. Wilson requires this because they believe -- rightfully -- that the room in which the speakers are used can have a great effect on the sound. To address this, the person who installs the speakers will go through an elaborate process of "voweling in" the speakers -- finding the best place in the room for them. This involves walking around the room and speaking, noting the locations where slap echo, comb filtering and the like have the least effect. Matt Tucker, the same person from Wilson Audio who installed a pair of WATT/Puppy 6es in Jim Saxon's Paradise digs, did the honors in my room, demonstrating the process to me along the way: walk, speak, listen -- all done systematically around the entire room. Once Tucker identified the "zone of neutrality," as he called it, he then moved a foot one way or another and began to speak again. It was easy to hear the difference. Tucker then placed the speakers in the designated spots (and installed the Phase Delay Correction spikes under the WATT), played music through the speakers, fine-tuned their positioning and toe-in, played them again, and finally spiked them to the carpet-over-concrete floor of my 12' x 24' listening room. The process took a couple of hours, with the speakers ending up closer to the back wall than I had thought they would be and toed in directly at my listening seat, which was pulled forward of its pre-WATT/Puppy 6 position. The owner's manual for the speakers gives copious amounts of information on setup, but it was obvious from seeing what Matt Tucker did in my room that optimum positioning should be done by someone Wilson Audio has trained to do so. The drivers used in the WATT are a 1" Focal inverted-titanium-dome tweeter and 6 1/2" ScanSpeak carbon-fiber midrange/woofer; the Puppy has a pair of 8" Dynaudio woofers. All of these drivers, in earlier but similar forms, have been used in the WATT/Puppy before, so why then has Wilson Audio redesignated the speakers? I've already mentioned the Phase Delay Correction system, which Wilson Audio has used for the MAXX, Grand SLAMM, and top-of-the-line WAMM, but is new to the WATT/Puppy 6. In addition, the cabinets of the WATT/Puppy 6es are slightly larger than those of previous models (making upgrade to the new version impossible) and constructed of advanced materials -- a phenolic-resin-based material for the WATT, and the same mineral composite from which the cabinets of the X-1 Grand SLAMM and MAXX are made for the Puppy. Wilson has chosen these materials because they provide "a nearly ideal blend of rigidity, mass and internal vibration damping." They are also akin to ceramic, so they actually crack when stressed to the limits of their very high strength. Also, earlier versions of the speakers would exhibit a creeping of the WATT on top of the Puppy, this caused by the micro vibration of the music played through both. The WATT/Puppy 6 solves this problem with the aforementioned PDC spikes, which couple the WATT to the Puppy and are hidden by a lip around the top of the Puppy. Finally, previous versions of the speakers were available in a stock variety of colors, but the WATT/Puppy 6 offers full advantage of the Wilsongloss palette. The same is true of the more expensive Grand SLAMMs, but that Wilson is now offering this for customers of the quarter-the-price WATT/Puppy 6 is notable. The 12-stage Wilsongloss finishing process is comparable to the painting that auto manufacturers like Mercedes do, so the new finish choices are no small concession, especially for something that is a luxury item. Around back are sets of new custom-made gold binding posts -- one on the WATT to which the umbilical is connected and one near the bottom of the Puppy for main hook-up -- and the ports for both cabinets. Wilson is so adamant about not biwiring or biamping the WATT/Puppy 6, even though it is possible, that they warn doing so will void the speakers' warranty. I'm not one to frown on biwiring or biamping, but given the obvious thought that's gone into these speakers and their cost, I would suggest using them as their maker intends. Wilson isn't keen on divulging crossover points for their speakers, but the crossover itself is a first-order design. The WATT/Puppy 6's rated frequency response is 21Hz-21kHz +0dB, -3dB; its sensitivity is given as 93dB and impedance as 4 ohms. Wilson Audio claims the WATT/Puppy 6 may well be very suitable for use with amps that output as few as 7Wpc. The WATT/Puppy 6 measures a compact 40 1/4"H x 12 1/4"W x 18 1/2"D but weighs 170 pounds -- 65 pounds for the WATT, which is hard to believable given its compact size. Ye olde knuckle-rap test produces sounds like those I heard when knocking on the cabinet of the recently reviewed Speaker Art Proklaim II -- stone-like deadness, especially from the WATT. I used the WATT/Puppy 6 speakers with a wide array of electronics. Matt Tucker used the Mark Levinson No.383 integrated amp during setup of the speakers, and I listened with it long enough to become really anxious to hear the WATT/Puppy 6es driven by my reference Lamm ML2 mono amplifiers and L1 preamp. Later in the review period the Lamm L2 Reference preamp showed up, as did the Bel Canto EV0 200.2 amplifier, so I also used these with the speakers. I tried a number of different sets of interconnects and speaker cables, including those from JPS Labs, TARA Labs, DiMarzio, DH Labs, and Nordost, preferring one set above all others (more on this later in the review). Source components were a Bel Canto DAC1 or Perpetual Technologies P-1A/P-3A combination driven by a Mark Levinson No.39 CD player or Pioneer DV-525 DVD player. Power cords were from ESP, TARA Labs, JPS Labs, and most of the time Shunyata. I used a PS Audio P300 Power Plant to power the preamps and digital components, and a special Shunyata power strip for the amps (and all components at various points). 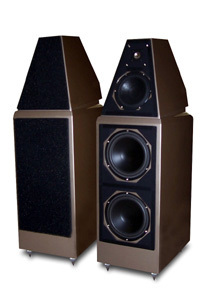 The review pair of WATT/Puppy 6es was supplied in Wilson Audio's cashmere beige finish. I requested the speakers in this finish, after seeing the choices on the company's website, because I thought it would photograph well. However, I wasn't prepared for the intense mirrored beauty of the speakers. I may be telling more about myself than I want to, but I've never owned a car that was as lustrously finished as the WATT/Puppy 6es I received for review. The shape of the speakers is crisply angular, and this is only accentuated by the high-quality finish, which Wilson offers in 11 different colors, some of which are Mercedes and Ferrari offerings. While I'd love to see the speakers in candy apple red or royal indigo blue, the subtle gold tone of cashmere beige suits me just fine. In terms of finish, construction, packaging and presentation, the Wilson WATT/Puppy 6es are without equal in my experience. Pride in the product? Obsession is more like it. One important in-use issue: As I mentioned, the speakers come with two sets of grilles. Given the beauty of the finish and the ample use of foam on the front baffle to cut down on diffraction, I strongly suggest using the grilles -- they dress the speakers up quite a bit. But which set? To me there's only one choice: the foam covers, which have no discernible effect on the sound of the speakers, or at least that I could detect. I can't say this about the more traditional framed grilles, which do not ruin the sound of the speakers by any means, but do affect their performance slightly, muffling the treble a bit. While some people may think the foam grilles are too cheesy for such an expensive speaker (and I would bet that Wilson includes the other grilles for these people), they do perform their intended function perfectly: hide the drivers while not adversely affecting the sound of the speakers. I came to this review influenced by what I've heard from earlier versions of the WATT/Puppy, but I was determined to assess the new speakers on their own merits, not clouded in any way by previous experiences. But I didn't have to try very hard. From the time the very first notes poured forth to the point of writing this review, I have been continually excited, seduced, and amazed by the Wilson WATT/Puppy 6 speakers. They are the finest speakers I've heard in my system, and their sound is as good as any I've heard anywhere, anytime. The obvious place to start discussing the performance of these wonderful speakers is with their bass capabilities. I've never been a bass fiend, although I have wanted to hear all of the music that my CDs have to offer, provided that my ears don't hurt in the process. The WATT/Puppy 6es do bass with greater dynamics and more realistic shading, detail and power than any speaker I've heard at length. I know that some of this is due to their final placement in my room, which enhances their bass capabilities through boundary reinforcement, but it's the quality of the bass, not just the obvious depth and weight, that makes it worth noting. I've been using "Joe Slam and the Spaceship" from Harry Connick's She [Columbia CK 64376] for years to test the low-end prowess of equipment I've reviewed, and the WATT/Puppy 6es reproduce the lowest tones of this track with wall-flexing power and a sense of their place in the mix. However, later in the track, when the electric-bass and kickdrum take over, the speakers unravel it all with consummate resolution and clarity. Clear bass? Yes. Even at lower listening levels the WATT/Puppy 6es have bass impact and control -- just as they do when you play your music at levels approaching the real thing. Very notable down low is how well the bass fits into the rest of the wide-bandwidth sound these speakers achieve. The bass does not seem like a separate entity, like that from a poorly integrated subwoofer. Instead, it has a seamless transition from the midbass, which offers some real power of its own and in turn flows like water from the midrange and above. While I wouldn't say the WATT/Puppy 6es have electrostatic-like single-driver coherency, there are no ragged transitions between the drivers, all of which come from different manufacturers. In fact, this is perhaps the WATT/Puppy 6's greatest trick: how multiple drivers in separate cabinets (one that can function as a speaker by itself!) are able to sound so integrated. Try that at home. Equally impressive as the bass of the WATT/Puppy 6es is their dynamic capability. These are speakers you can use for background music or as the main event. Listen as you cook or pay the bills, and you'll still get a pleasurable sense of scale; or you can listen at very loud levels, in which case the WATT/Puppy 6es will play with supreme clarity. And these speakers go from soft to loud in a more realistic fashion than any other I've heard, even (and especially) when driven with the Lamm ML2 SET amps I use as my reference. "Runnin' Too Deep," from Keith Richards' Main Offender [Virgin 86499 2], a CD I use habitually for reviewing purposes, begins with some drum work but then takes off when the electric guitars enter, which can be startling. The WATT/Puppy 6es gave me a shiver when the guitars came screaming in, and I quickly thought cooool. Yes, high-end audio can appeal to us on intellectual and emotional levels, but sometimes a jolt of surprise is in store too. And the WATT/Puppy 6es surprised me again and again. But playing music loudly, really loudly, is often an exercise in picking only the best recordings, those whose treble is perhaps on the dark side of neutral. As I've indicated, my earlier brushes with the WATT/Puppy have left me thinking the speakers were analytical, and this was certainly a function of their treble, which always seemed hot to my ears. Not so with the WATT/Puppy 6es, whose treble is sweetly detailed and delicate. Tony Overwater's Up Close [Turtle Records 198119] is an audiophile recording that I first heard a couple of CESes ago and have played many times since. It sounds supremely extended up top, and the WATT/Puppy 6es don't dilute this at all, sounding silky in the treble region but never overbearing. "Ironic," an instrumental cover of an Alanis Morisette tune from this same disc, is spacious-sounding and rich in ambience over the WATT/Puppy 6es -- utterly so. And the discussion of ambience leads me to talk about the way the WATT/Puppy 6es throw a soundstage and are able to focus on performers in it. Like the fine-tuning control on a microscope, the speakers snap image outlines into view, not by artificially emphasizing any part of the musical spectrum, but rather, I speculate, by reducing overall distortion. These speakers sound ultra clean, but not in any hyped way. Instead, the music emerges from them with a naturally vibrant sense of life -- only bettered by live music in my experience. Hence, the soundstage they throw is enormous, richly populated with properly scaled images, and holographic. It took me a while to adjust because the speakers were closer to the front wall of my listening room than I was used to, but with recordings like The Hot Guitars of Biller and Wakefield [HMG 3006] and Buena Vista Social Club [World Circuit/Nonesuch 79478-2], the WATT/Puppy 6es were able to melt the walls away, showing width and depth in recordings that I had never noticed previously. At high or low listening levels, with treble-challenged or darker recordings, the WATT/Puppy 6es delivered more of the recordings and their particular flavors than other speakers, showing to me how completely together their sound is. One sonic attribute just flows into the next, creating a musical tapestry that's seamless in its quality -- a rare feat for sure. Obviously I found my time with the WATT/Puppy 6es to be musically involving, but I also have to mention how significant these speakers are as reviewing tools. They are easily able to convey the differences in electronics, interconnects, speaker cables and power cords, but perhaps their greatest contribution to my reviewing has been in the ability to drive them with any amplifier I can think of. The speakers' higher-than-average rated efficiency (which our NRC measurements may or may not uphold) made them an easy task for my 18W Lamm amps to drive. In fact, the Lamms have never sounded better, the speakers and amplifiers offering a kind of synergy that I haven't reproduced with other speaker/amp combinations. But when I used the Bel Canto EVo 200.2 or Mark Levinson No.383 solid-state units, the particular sound of both came shining through, and the music kept me completely interested in what I was hearing -- no academic exercises with the WATT/Puppy 6es. And here's a tip I received from Dave Gordon at Audio Research: If you get to hear these speakers with tubes, try using the amp's 8-ohm taps (if the amp has them). Although the speakers are rated as a 4-ohm load, their impedance plot is supposed to be fairly benign -- no steep angles for the amp to contend with. With my Lamm amps, using the 8-ohm outputs resulted in a slightly more authoritative sound, perhaps due to the added voltage gain, and a bit more tonal purity. I also tried a number of different sets of interconnects and speaker cables, but the ones I preferred were from Nordost -- Quattro-Fil interconnects and SPM Reference speaker cables (spade-terminated speaker cables only, however, because the WATT/Puppy 6's new binding posts won't accept banana plugs). These are very open, neutral, and extended cables, and they mated ideally with the WATT/Puppy 6es and the Lamm amps, letting the electronics and speakers do their work with little or no hindrance -- or at least this is what I perceived in comparison to the other cables I used. Nonetheless, if you have cables you already like, the WATT/Puppy 6es will tell you exactly what they sound like, so be prepared. I can't say that any of the cables I had here were disappointing, but the Nordost wires just seemed to be synergistic with the Wilson speakers and Lamm electronics. The only speaker I've heard in my system that's comparable to the Wilson WATT/Puppy 6 is the $15,000-per-pair Kharma Ceramique 1.0. The two speakers are beautifully finished, rather efficient, and ooze the sense of extravagance that their prices engender. However, they are also rather different-sounding speakers, the Kharmas being darker overall but with a very noticeable sense of coherency from treble to midrange, where the speakers are at their best. The Ceramique 1.0's bass is very impactful, conveying the weighty thump of kickdrum very well. The WATT/Puppy 6es, on the other hand, have a lighter tonal signature, although I would not characterize them as bright in any way. Their bass equals that of the Kharmas in essentially every way, while going much deeper and providing more power. Their midrange is not as utterly clear as that of the Ceramique 1.0s, but it is very fine nonetheless. My Lamm amps drove both speakers well, although I would have to say that the WATT/Puppy 6es were able to play more loudly on the 18 SET watts. I wrote a "Standout Systems" article on my Lamm electronics and Kharma speakers, the two often paired at shows. However, I would say that the Wilson speakers and Lamm electronics may be even more synergistic. Vladimir Shushurin at Lamm told me long ago about an owner of his electronics who uses ML2s to drive Wilson X-1 Grand SLAMMs. Vladimir says what he means, and only that, and he's said that this is the most impressive system he's ever heard. Shushurin believes that speakers like the Grand SLAMMs -- wide-bandwidth, low-distortion, high-efficiency designs -- mate very well with his electronics, especially the ML2s, whose sound is so refined they need a speaker that will deliver everything they have to offer. The WATT/Puppy 6es seem to fit the bill too. WATT more can I say? Wilson Audio is well known for updating its designs to improve their sound, but I'm at a loss as to how the company will make the WATT/Puppy 6es significantly better. The latest iteration of the WATT/Puppy has powerful and expressive bass, holographic soundstaging, precise image focus, sweet highs, and a fully integrated sonic character. It can also be driven by just about any amp -- even single-ended triodes. I've heard a number of very fine speakers, both in my listening room and at shows, a good number of which cost as much as or more than the WATT/Puppy 6. They're all noteworthy in their own ways, some offering one thing or another that the WATT/Puppy 6 can't quite match. Yet there's not one, even the ProAc Response Fours I used to own, that I would choose over the Wilson WATT/Puppy 6. But what makes the WATT/Puppy 6es truly great speakers is the way they involve me in the music they reproduce, something I wouldn't have thought a Wilson Audio design could do -- for me at least. More than anything else, these are speakers I simply enjoy, not for their capacity to fulfill my list of audiophile wishes but rather for the way they (along with my Lamm electronics) communicate the soul of a performance. I'm sure there are a number of reasons for this ability, but they're unimportant when the end product -- the music -- is so completely engaging. Enough already. Run out and hear these speakers. And if you find yourself spouting praise uncontrollably, you're not alone. Price: $19,900 USD per pair.